London Design Festival 2014: the Dezeen and MINI Frontiers exhibition features ideas for the future of travel created by six cutting-edge young designers (+ slideshow). Part of Dezeen's ongoing collaboration with car brand MINI, the Future of Mobility envisions different ideas about the way car design will evolve. From ubiquitous augmented reality to long-haul space travel, the exhibition features a series of radical concepts for how we might get around in years to come created by Alexandra Daisy Ginsberg, Dominic Wilcox, Keiichi Matsuda, Matthew Plummer-Fernandez and Lucy McRae. 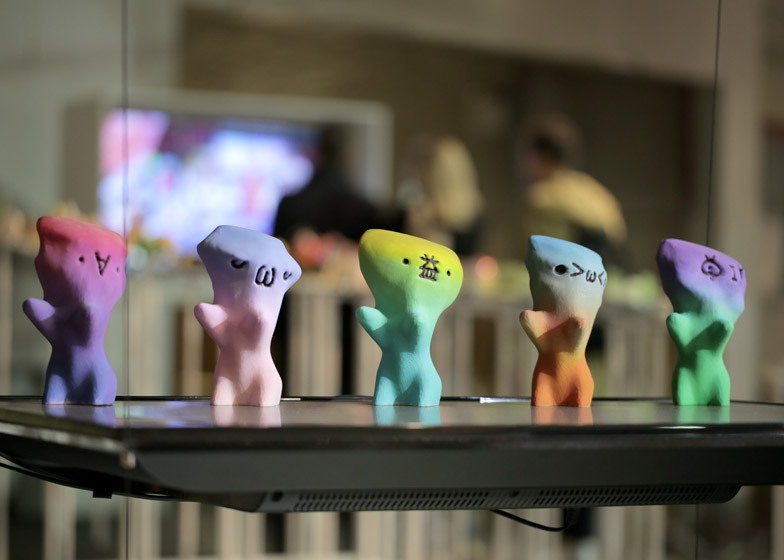 Their designs are being shown in a space designed by architect Pernilla Ohrstedt with 3D-scanning specialists ScanLAB, which seeks to create a physical expression of the digital point clouds our cars may one day use to navigate around cities. Launching tonight with a party in London's West End, the Dezeen and MINI Frontiers: the Future of Mobility exhibition will be open to the public from tomorrow until 21 September as part of the London Design Festival. Visit the exhibition at designjunction, the Sorting Office, 21-31 New Oxford Street, London WC1A 1BA. 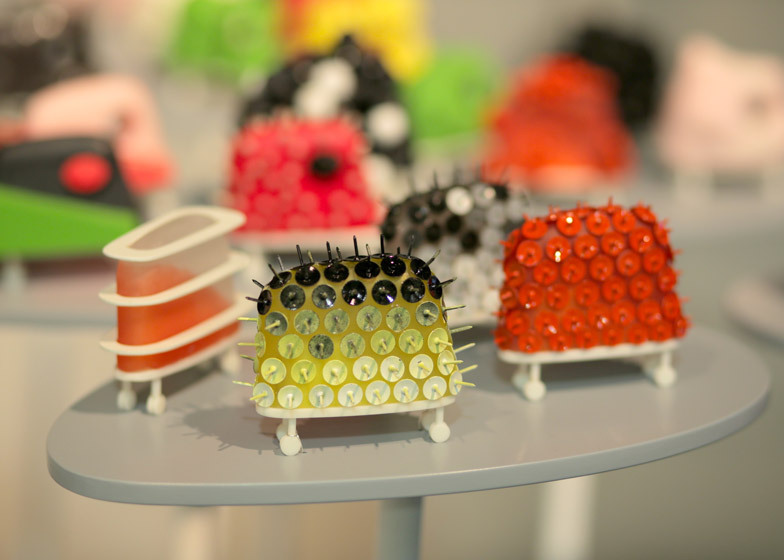 Alexandra Daisy Ginsberg’s Design Taxonomy imagines design subjected to biological rules. In this alternative vision for sustainable production, resource-intensive metals and plastics have been replaced by a new wave of degradable biological materials that can be cheaply and efficiently replaced. 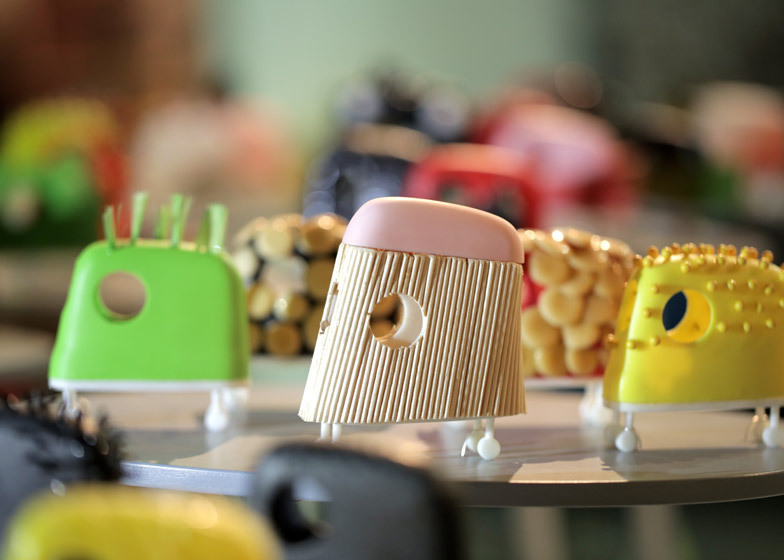 Car companies no longer produce entire vehicles, but rather manufacture and distribute a durable chassis block, onto which disposable, locally produced bio-shells can be added. In this scenario, adaptation, mutation and evolutionary patterns would start to emerge. 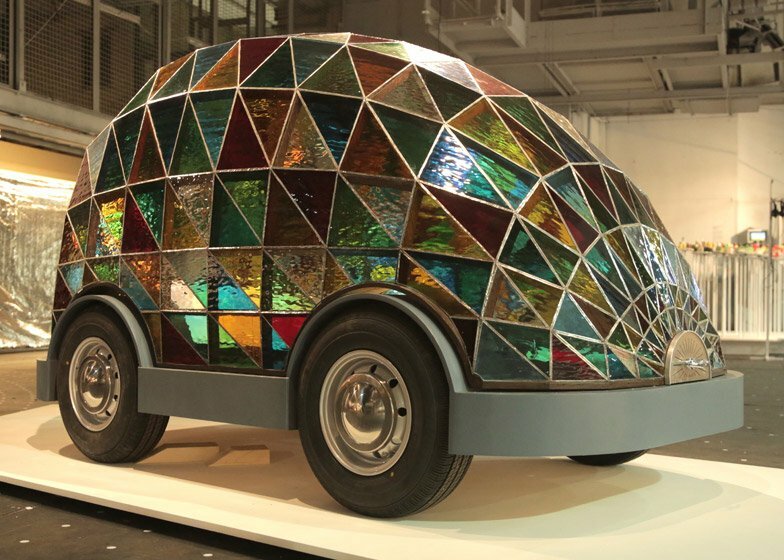 Here, Ginsberg presents a single car, which diversifies down thirteen generations and across five climate zones to produce over one hundred different designs. 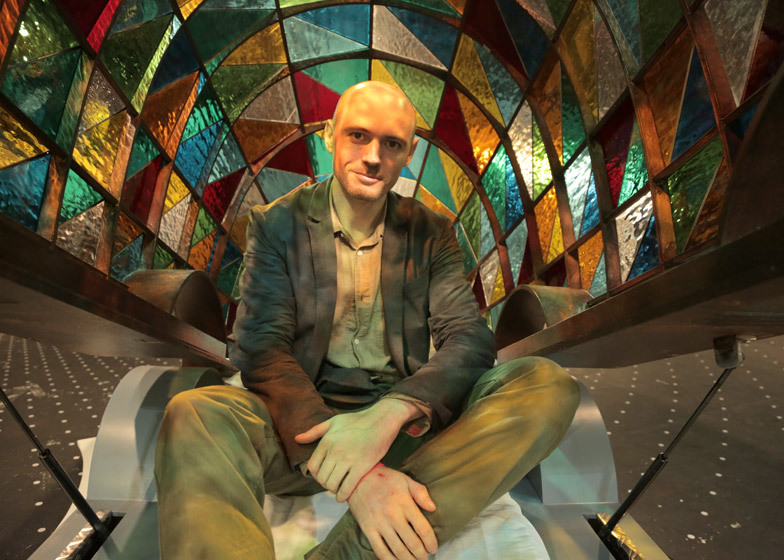 In a future of fully automated, computer-controlled vehicles, airbags and crumple zonestraffic collisions will be a thing of the past, Dominic Wilcox suggests. 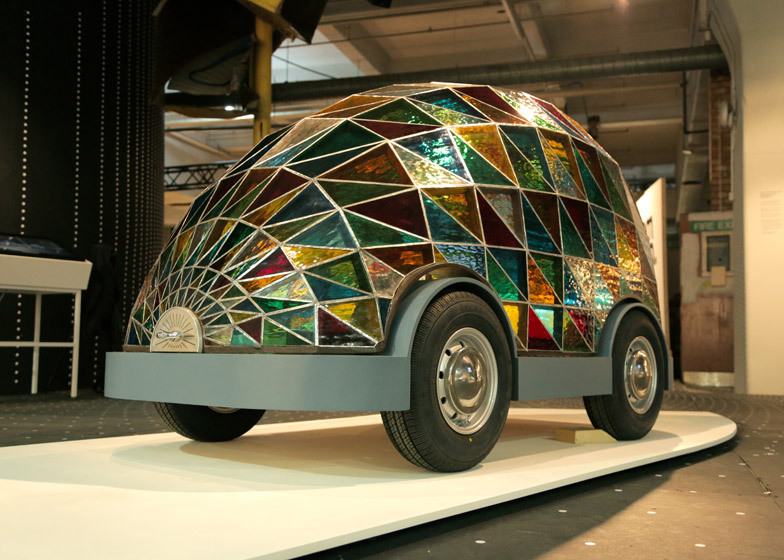 So why not build a stained-glass car? Wilcox proposes that by the year 2059 – 100 years after the first MINI went into production – driverless cars will make current safety requirements redundant. This will give car designers total freedom of form and material. 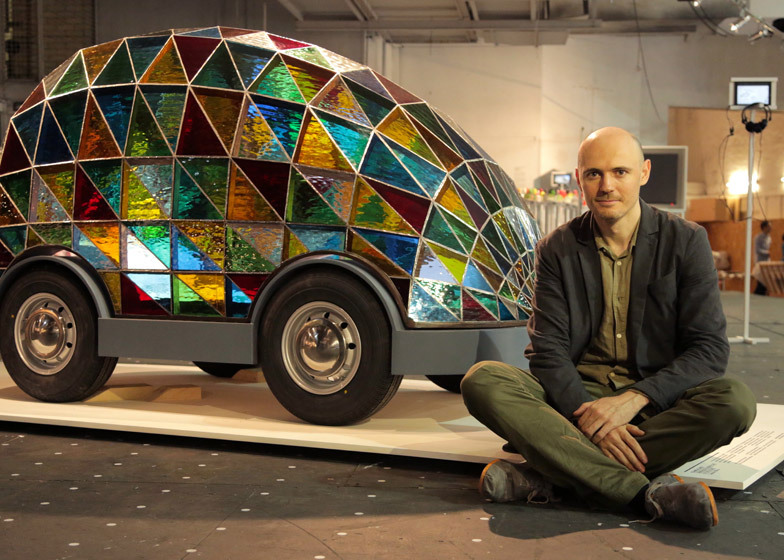 Inspired by the tranquil interiorstained-glass windows of Durham Cathedral, Wilcox has built a car using the same techniques used to make Tiffany lampshades. 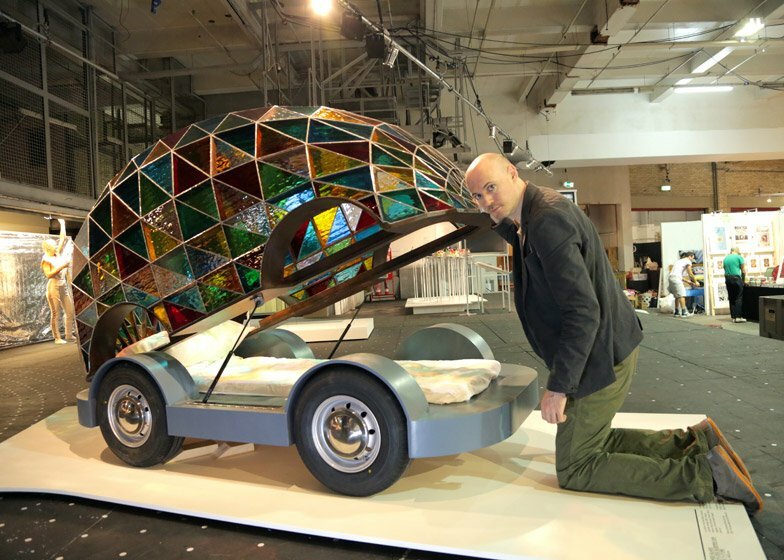 Hand-cut glass has been soldered onto a wooden frame to create a shell that encases a single bed, which the passenger can relax in as the car takes them where they need to go. But our cars of the future could take many other forms. Taxirobot.co.uk is a concept website by Wilcox, where customers can order a car with a bed, restaurant, office or even a Jacuzzi inside and pair it with an exterior shell of their choice. 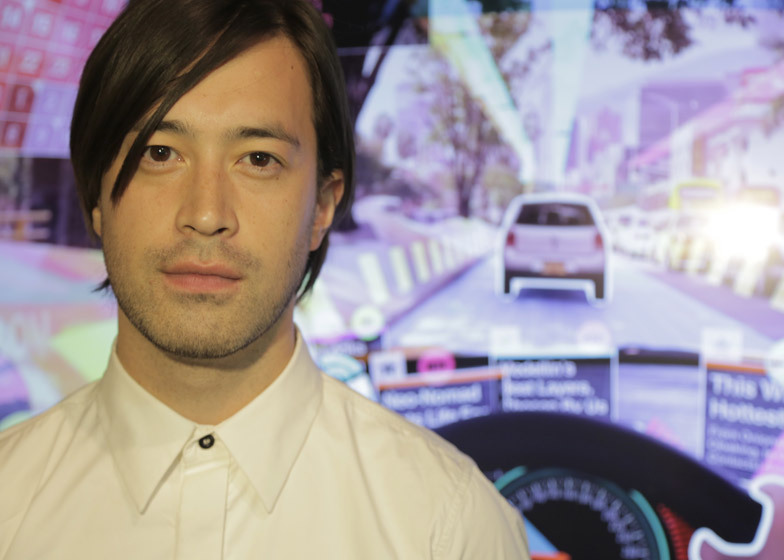 In this extract from his Hyper-Reality series of films, Keiichi Matsuda explores what it would be like to live in a world where digital information such as turn-by-turn navigation and road signage is superimposed onto the physical world via augmented reality. 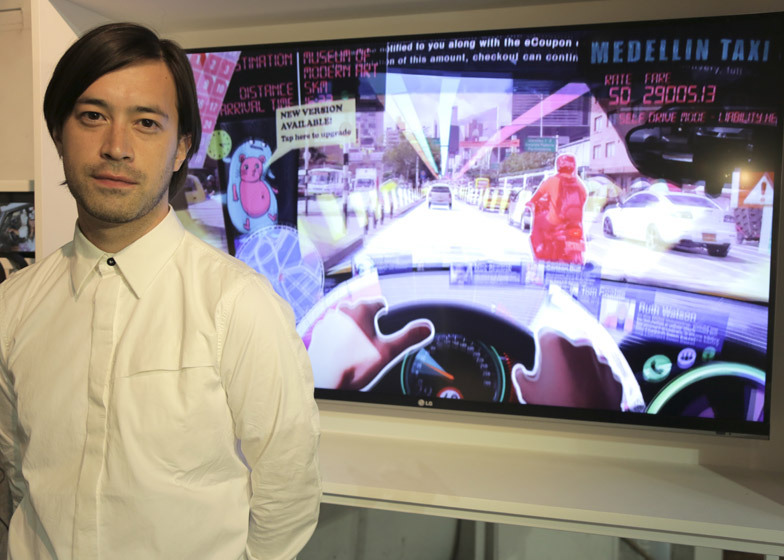 Set in Medellín, Colombia, Matsuda’s film imagines the future of the city from the perspective of a driver. Augmented reality has become ubiquitous and people are constantly immersed in a digital layer of real-time information. Buildings and infrastructure are no longer static, but fluid, interactive and endlessly updating. 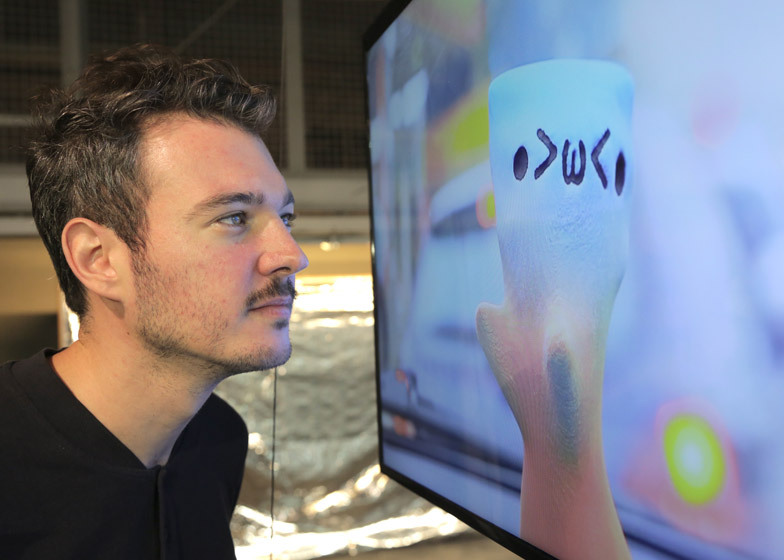 He proposes that vehicles will have their intelligence personified in a physical artefact: an avatar we take with us on our travels, ready to install in any vehicle we travel in. 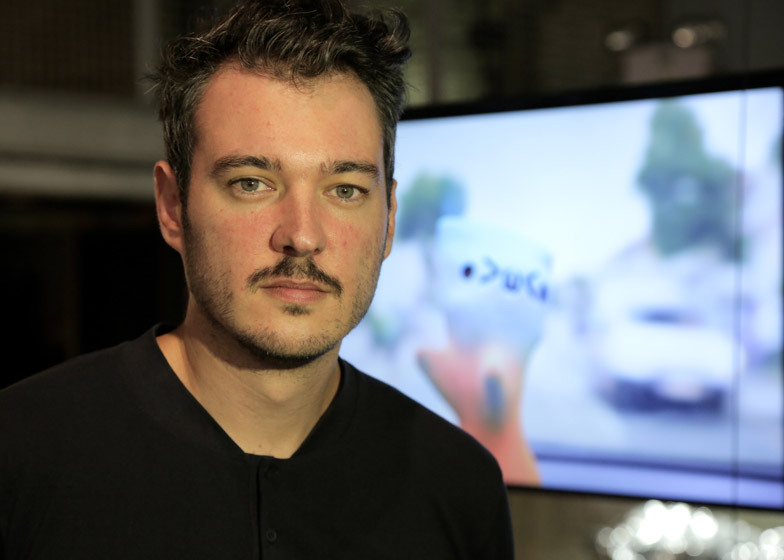 Unique Passengers is a prototype avatar-generating service developed by Plummer-Fernandez. 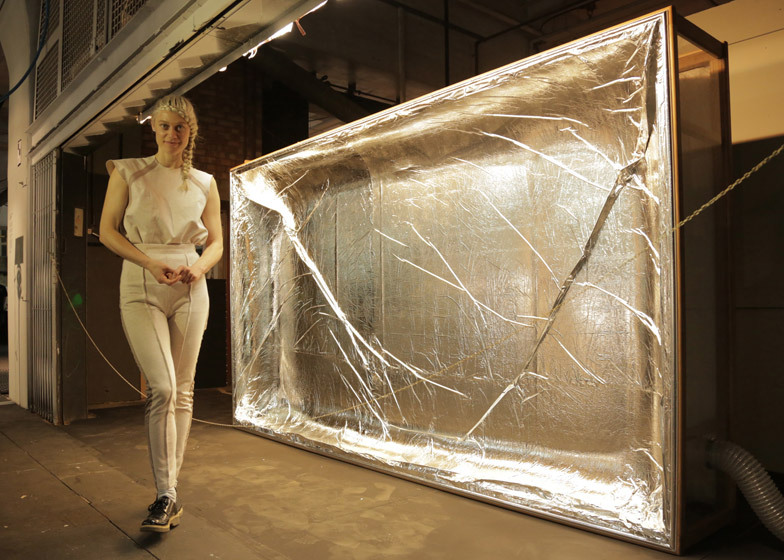 In the first of a series of experiments looking at the effects of zero gravity on the human body, Lucy McRae has developed a speculative vacuum chamber designed to prepare the human body for long-distance space travel. Based on the principles of negative pressure vacuum therapy, McRae’s chamber puts the body into a sort of suspended animation as it is hugged by a plastic membrane. McRae’s artistic installation is underpinned by scientific research carried out by NASA, which developed a negative pressure device in the 1960s to improve blood flow to the lower extremities of astronauts’ bodies. Driverless cars will use 3D-scanning technology to accurately locate themselves in their environment and navigate the world. As they become widespread, the data they capture will gradually allow us to create a 1:1 replica of the real world in the form of a digital "point cloud", suggests Pernilla Ohrstedt. 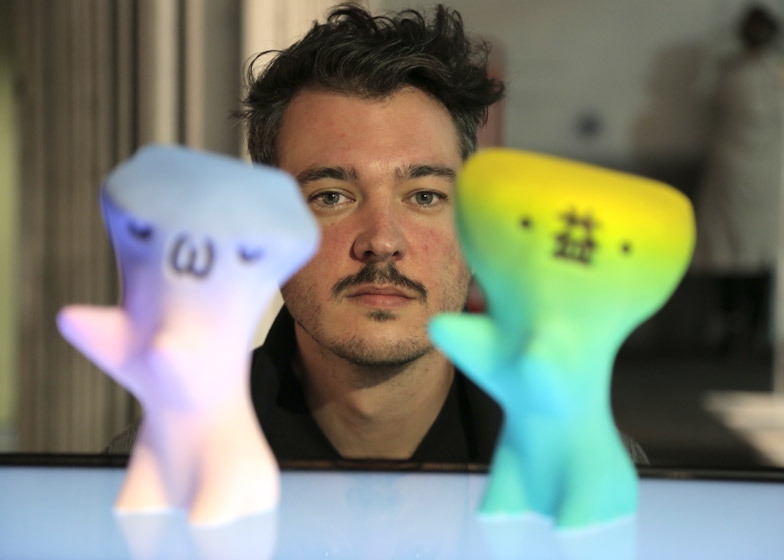 Glitch Space, which provides the backdrop for the exhibition, is a physical representation of what the data captured by the first driverless cars will look like. 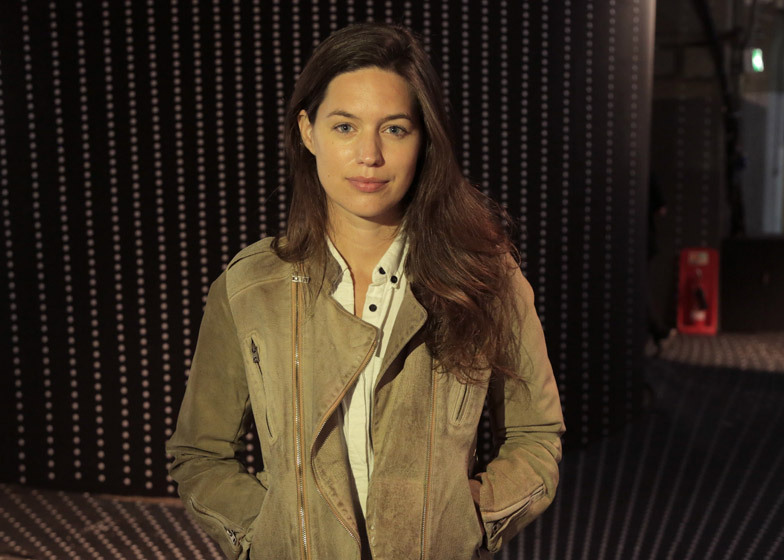 Ohrstedt and ScanLAB Projects have scanned the space at designjunction and superimposed that data back onto the building, creating the landscape on which all the exhibits are displayed.